g.Nautilus, analog oscillators, control voltage, python, max msp, EEG recording, custom software. Encephalon, sonification of brain activities during sleep, relaxation, meditation, attention and wakefulness. • Alpha-waves (alpha rhythm, 8-13 Hz) - basic neocortex rhythm in a relaxed state and/or with eyes closed. Detectable throughout the scalp, particularly in the occipital lobes. • Mu waves (8-12 Hz) - particular kind of alpha waves detected in sensorimotor areas in the absence of movement, decrease when the subject moves. • Beta waves (13-30 Hz) - indicate the state of alert and active concentration, detected over the parietal and frontal lobes. 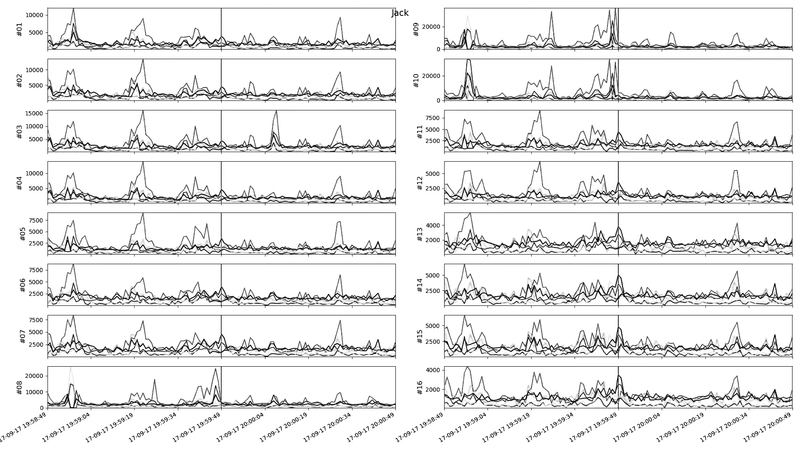 • Delta waves (0.5-4 Hz) - detectable in babies and during sleep in adults. • Theta waves (4-8 Hz) - characterize the state of “drowsiness” and light sleep in babies and adults. • Gamma waves (30 Hz and above) - in the alert state while solving tasks involving short-term memory and multisensory integration. • High gamma waves (70 Hz and above) - during motor activity. • got the test subject in various state of mind and body: sleep, relaxation, meditation, attention and wakefulness. 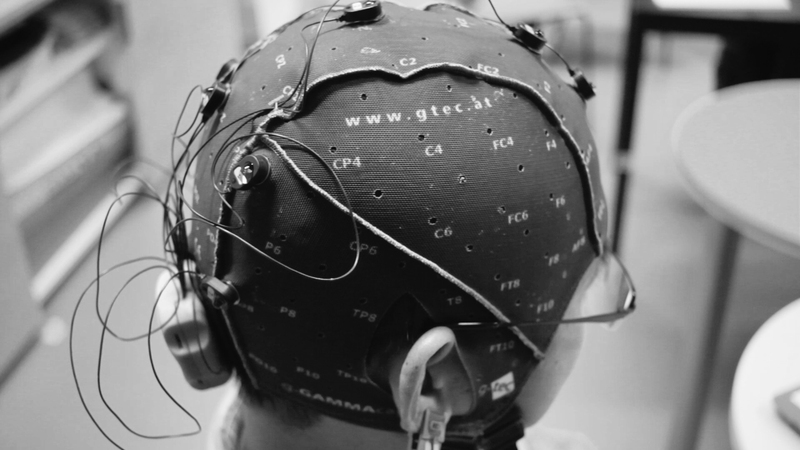 • recorded EEG with the headset with motor imagery electrode positioning. • added Notch and Bandpass filters. • applied (real) Fast Fourier Transform (RFFT). 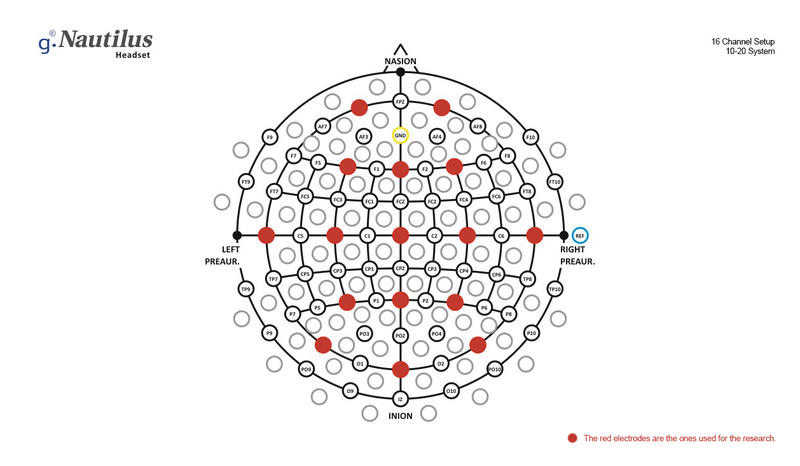 • extracted dominant frequencies and cluster the data according to the classes of brain waves. • streamed the data to custom software. • applied control voltages to modulate analog oscillators based on ratios of brain waves classes and applied modulation based on dominant frequency for given sample. Project initiated during BR41N.IO [The Brain-Computer Interface Designer Hackathon] in September 17-18, 2017 at the Institute of Neural Engineering in Graz, Austria.